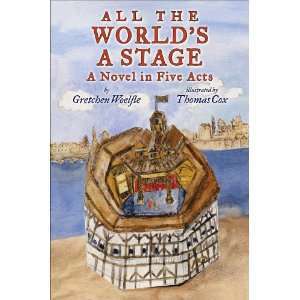 One of the most prolific children’s authors I know is Gretchen Woelfle, whose most recent work is her wonderful debut novel, a work of historical fiction, ALL THE WORLD’S A STAGE: A NOVEL IN FIVE ACTS. Here is Gretchen, with a solution so obvious, I forgot to mention it! “I suffer from procrastination. Well, that’s not exactly true – I don’t always suffer. I often enjoy those activities that delay putting fingers to keyboard. I’ve heard writers claim they don’t check email until noon. I don’t believe them. It’s theoretically possible, I suppose…. Biographers and historical fiction writers (like me) have the best excuses for not writing. Trips to libraries and internet browsing, reading, taking notes, checking footnotes and bibliographies for more books and more net surfing. Phone calls and emails to experts that make me feel oh-so-justified for not writing. OK, enough of the problem. What are my solutions? DEADLINES – real or invented – and defending my reputation. • A contracted book – It’s amazing how much easier it is to write when ready cash is involved. • An encouraging letter from an editor – “We like it but would like see a revision before we buy it.” I’ll usually get this done more or less quickly, unless the proposed revision is so far from my vision that I decline. • My critique group – My reputation is at stake here. What am I doing if I can’t produce enough writing to critique once a month? I’m not the only one to send my work to the group at the last minute. It’s nice knowing that my procrastination gene is not a rogue mutation. • Monthly writing goals – Not life goals or even research or marketing goals, but writing goals – as in first draft of chapter two, revised draft of chapter one, completed manuscript. I print and tape my monthly goals to my printer and they glare at me all month long. I share these goals with online writer buddies and each month I ‘fess up: DONE, IN PROGRESS, NOT EVEN STARTED. This trick often works because my self-respect is on the line. A slacker – who, me?